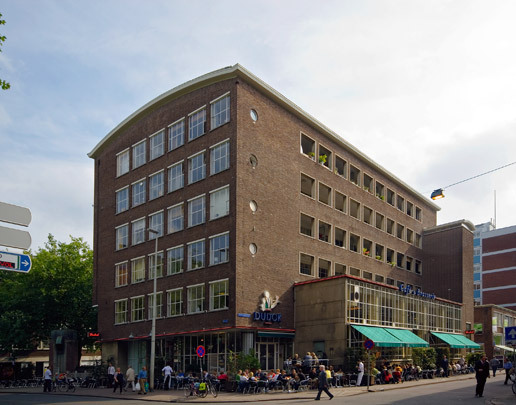 It was only when a 'grand café' was opened in 1991 in this former insurance office that this building by Dudok came into the public eye. The post-war work of this architect who trod the dividing line between traditionalism and functionalism is regarded as being of lesser significance, most probably without justification. The building combines a 6 metre high basement with four levels of maisonettes, the whole topped by a curved concrete shell roof. The ground floor is dominated by the 6 metre high staff hall with its large expanses of glass and enlivened only by round columns. The former entry zone on the Meent boasts a mezzanine.